The soy checkoff invests a substantial portion of its budget every year in production research. Researchers in the public sector as well as breeders at private companies agree that there is value in the checkoff’s research accomplishments. These projects and relationships that the checkoff fosters between the public and private sectors are critical to developing new technology that benefits farmers. As soybean farmers, the directors of the New Jersey Soybean Board understand production challenges unique to the state, and the board works to address those challenges. Partnering with local researchers allows the New Jersey Soybean Board to efficiently improve soybean production and focus on production issues specific to New Jersey soybean farmers. This soil health project will survey soils from two conventional fields of soybean and field corn each from 5 central Jersey soybean/corn farms with 6 major soybean farmers in north, central and south Jersey. Standard measures will be taken as to soil composition, CED, pH, inorganic nitrogen, organic matter and fertility as well as biologically derived amounts of nitrogen produced by microbial mineralization. Rutgers Cooperative Extension of Monmouth County Agricultural Agent Bill Sciarappa will compare results to 2016 results for conclusions. NJSB is providing funding to assist the efforts of the Plant Management Network to benefit farmers through the development of high-quality, information-rich webcasts authored by state extension soybean experts, providing information on topics such as management of a particular weed or disease, or agronomic practices to help growers reach their soybean yield potential. These webcasts can be conveniently viewed by growers anywhere through a computer or device. NJSB recognizes that biodiesel is an important market for soybean farmers. NJSB is providing funding to assist the efforts of the National Biodiesel Board to ensure that staff from state regulatory agencies and professional environmental organizations have access to accurate information about biodiesel. This will help create and strengthen the biodiesel market while providing smooth implementation processes in Northeast states and municipalities. New Jersey soybeans have been threatened in recent years by an explosion in the Mexican bean beetle population and could soon be facing additional stress by brown marmorated stink bugs and kudzu bugs. Mark Mayer, an entomologist with the New Jersey Department of Agriculture, is exploring biological control methods to decrease the reliance on insecticide applications used to combat Mexican bean beetles. Field surveys will also be conducted to give New Jersey soybean farmers more information about the current and future threat of all three of these insects in order to better prepare future pest-management strategies. 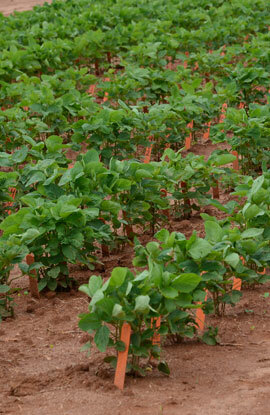 One of the goals of the soy checkoff is to continue developing the market for soy products. The grant awarded to the WISHH project by NJSB will help to introduce and increase the use of U.S. soy protein among food companies in developing countries while increasing the volumes of soy protein moved under U.S. food aid programs. 0 percent biodiesel in heating oil within the ASTM specifications.